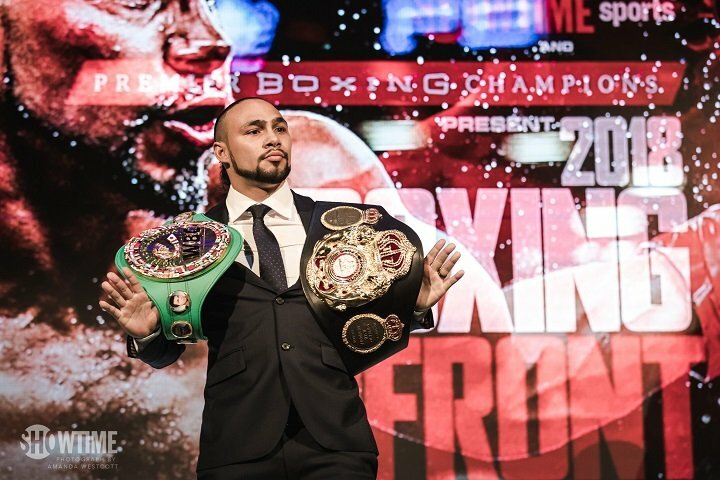 By Jeff Aranow: Keith ‘One Time’ Thurman is rumored to be on the verge of signing with promoter Eddie Hearn, who recently signed a $1 billion, 8-year streaming deal with DAZN/Perform. Thurman, 29, is training near Tokyo, Japan, which is where Hearn was last Friday for the Jamie McDonnell vs. Naoya Inoue fight. Hearn promotes McDonnell. Hearn signing a fighter that fights once a year might not be the wisest move on his part if he does ink Thurman. This might be a risky move on Hearn’s part. It’s like an NFL team signing a college football player coming off a knee injury. It’s risky. It might not work out. Will Hearn have to eat Thurman’s contract if turns out he’s a washed-up fighter or can he cut him and walk away after 1 or 2 fights? On the surface, the main positive that comes from Hearn possibly signing Thurman is he might be able to get some of the other top names in the U.S to sign with his Matchroom Boxing USA stable. If the fighters hear about Hearn inking Thurman, then they might want to sign with him as well. It’s the basic herd mentality. I’m not sure it’ll work in this case, because Thurman is perceived as a fragile, part-time fighter, whose career is on the downside at this point despite him holding the WBA welterweight title. There’s no word about how much money Hearn is offering Thurman to sign with him. Hearn offered Adrien ‘The Problem’ Broner roughly $2 million per fight for a 3-fight deal for 1 year. Broner rejected the initial offer from Hearn. You would have to imagine that Hearn’s offer to Thurman would be above that number, as he’s world champion, and he’s still unbeaten. However, there’s a huge risk on Hearn’s part if he signs the injury-laden Thurman. If Thurman continues to suffer injuries one after another, it might take years for him to complete a 3-fight deal with Hearn. If all Thurman can do is fight once a year due to his injury issues, Hearn will be waiting around a long, long time for that contract to be completed. It might be wise for Hearn to have a time limit on the deal. For example, if Thurman doesn’t get the 3 fights done within one year, Hearn should have an opt-out in the contract, because it doesn’t help his promotional company if Thurman is only able to fight once a year. His popularity won’t increase with that activity level. For Thurman to be a star for Hearn, he needs to be physically capable of fighting 2 to 3 times per year. When Thurman does come back, he’s going to need to be brought along slowly until he’s 100 percent. There’s going to be a lot of ring rust on him due to his inactivity. Right now, Thurman isn’t scheduled to fight anyone, and it’s already been 14 months since he last fought. Even if Thurman’s next fight were to be announced tomorrow, we’re probably looking at 3 months before he fights. That’s 17 months of inactivity. What kind of an opponent will Thurman be fighting coming off that kind of layoff? If Thurman does sign with Hearn, he won’t be fighting until September, because that’s when his DAZN deal starts. Thurman will have been out of the ring for 18 months by that time. If Thurman is going to fight a bum in September, it’s doubtful that he’ll be much use to Hearn for his first fight of his contract with him. For Thurman to bring in the subscribers for Hearn’s new streaming platform, he needs to be fighting quality fighters like Danny Garcia, Errol Spence Jr., Shawn Porter and Terence Crawford. The U.S boxing fans aren’t going to subscribe to see Thurman fight a fringe contender they’ve never heard of before and have no interest in seeing. Hearn says that he only needs one big name to add to his Matchroom Boxing USA stable for the other top names to quickly follow, according to @NoSparring. It’s unclear why Thurman is training in Japan rather than the U.S. Perhaps he wants to get away from the intense scrutiny that he’s been under. Training in Japan will let the chronically injured Thurman escape the U.S media, who have been following his stalled-out career and wondering when he’s eventually going to fight again. There was a time where Thurman (28-0, 22 KOs) was considered the best fighter a 147, but he’s no longer viewed in that light by fans due to injuries. It’s been 1-year since Thurman last fought in beating former WBC welterweight champion Danny Garcia by a 12 round split decision on March 4, 2017. Thurman came out of that fight with an elbow injury that required surgery. Those types of injuries, which involve a joint, require a lot of time to come back from. Thurman was hoping to fight on May 19, but he injured his left hand training, and he’s now nursing that injury, trying to heal up for a potential comeback in the summer. Thurman vacated his WBC welterweight title recently, and his WBA belt could be next to go if he doesn’t get back in the ring soon. The World Boxing Association has been patient with the injured Thurman thus far, but they’re not likely to just let him sit on their title not fighting indefinitely. What Hearn might not have understood when he signed streaming deal with DAZN is how difficult it would be for him to sign the top U.S based fighters. A lot of these guys are loyal to the charismatic manager Al Haymon, who has treated them kindly and paid them well. These fighters aren’t going to easily turn their backs on Haymon without being offered a huge contract. If the offer Hearn made to Adrien Broner is an example of the money he’s offering to the other U.S fighters, then he’s going to find it difficult to ink the top guys from the U.S. Perhaps that kind of money would work for Hearn to sign UK fighters in his home in England, but in the U.S, the elite boxers want more. If Hearn is going to be tight-fisted when it comes to making offers to sign the top U.S fighters, then he’s going to ultimately fail with his U.S portion of his DAZN streaming deal. Hearn has 16 dates per year in the U.S to televise his fighters, but he has yet to sign anyone that would attract boxing fans to subscribe with him. Hearn reportedly signed former WBC middleweight champion Julio Cesar Chavez Jr. and Gabriel Rosado. Those are guys that have seen better days and are no longer relevant. Hearn is going to need to sign much better fighters than this if he wants his deal with DAZN to work out for him. Hearn signing Thurman would have been a big deal if it had taken place a year ago before he suffered his elbow injury, but right now it might not be a good thing. Thurman’s career is up in the air right now. Hearn would arguably be better off signing a healthy young fighter like Errol Spence Jr. instead of Thurman. Hearn’s rumored move in potentially signing Thurman is reminiscent of how teams in the NFL and MLB sign players that are coming off injuries, and they quickly find out that those players are no longer able to perform at the levels they once did. You see it all the time in sports. If Thurman is never the same fighter he once was physically, Hearn will end up with very little to show for signing him.